Alleged schematics for a so-called "iPad Air Plus" hit the web this weekend, giving us what could be an early glimpse at the size and specifications of a brand new Apple tablet. Also known as the iPad Pro, the device is expected to pack a massive 12.2-inch display and a few nice surprises. One of those surprises could be four (yes, four!) speakers that deliver improved stereo sound. Apple's latest iPads have two speakers, but they're both located along the bottom edge of the chassis. According to these schematics, the iPad Air Plus will have two on its bottom and two on its top. That's in addition to a 12.2-inch Retina HD display and Apple's next-generation A9 processor. The device is expected to measure 305.31mm tall by 220.8mm wide, and just 7mm thick — that's just 0.1mm thicker than the iPhone 6 Plus, and 0.9mm thicker than the new iPad Air 2. 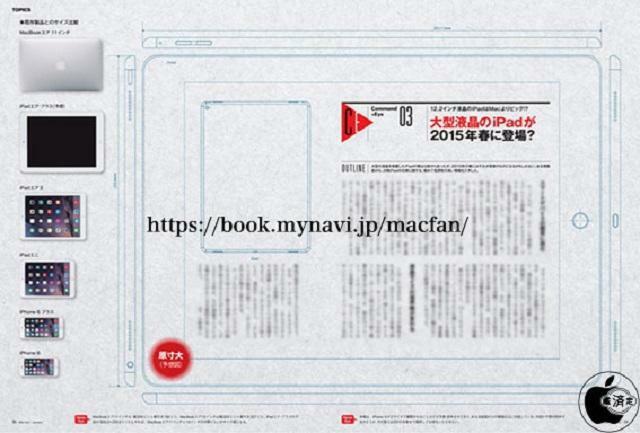 According to Japanese website Macotakara, which obtained these schematics from a copy of January 2015's MacFan magazine — which is being printed this month — the iPad Air Plus will be available between April and June of 2015. Bloomberg and other big publications have also promised an early 2015 launch. The concept of a larger iPad — one that really could replace a notebook for many — is an incredibly exciting one. Apple's unlikely to ever give us a touchscreen MacBook, so a giant iPad with a physical keyboard is probably the closest we'll get. However, I can't help but be put off by the size of the bezels in the schematics above. While manufacturers like LG and Sharp have been making efforts to eliminate bezels on their latest devices, Apple seems to be content with keeping them fairly chunky. That means the iPhone 6 Plus is bigger than other smartphones with 5.5-inch screens — like the G3 — and a little too big for a large number of phablet fans. Making bezels smaller should be even more important with larger devices, and having more room under the hood should make it easier, too. But this rumored iPad Air Plus looks just like a regular iPad Air blown up — which means its bezels are even thicker. MacFan also has some details to share about Apple's iPad mini 4, which will reportedly get the iPad Air 2's A8X processor next year, and share the same slimline design. The original iPad mini and the new iPad mini 3 are expected to be removed from Apple's lineup next year, leaving the iPad mini 4 for those who want the latest specifications, and the iPad mini 2 for buyers on a budget.